Noise Ninja, the noise reduction software and plug-in for Photoshop and Elements, is great, but an often over-looked feature is it's ability to apply a mask to the noise filter. 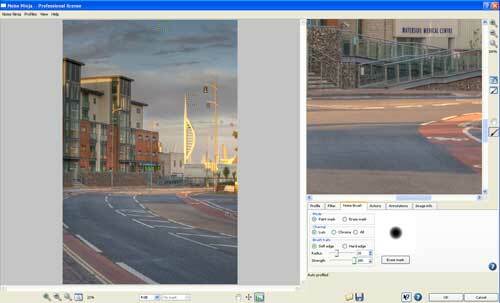 You may want to prevent NN from touching parts of the image to avoid loosing texture and detail. It's incredibly easy to do, so if you're using, or thinking about using, Noise Ninja, have a practice and pretty soon you'll become more selective on the areas of your photographs that you'll let Noise Ninja filter for noise. 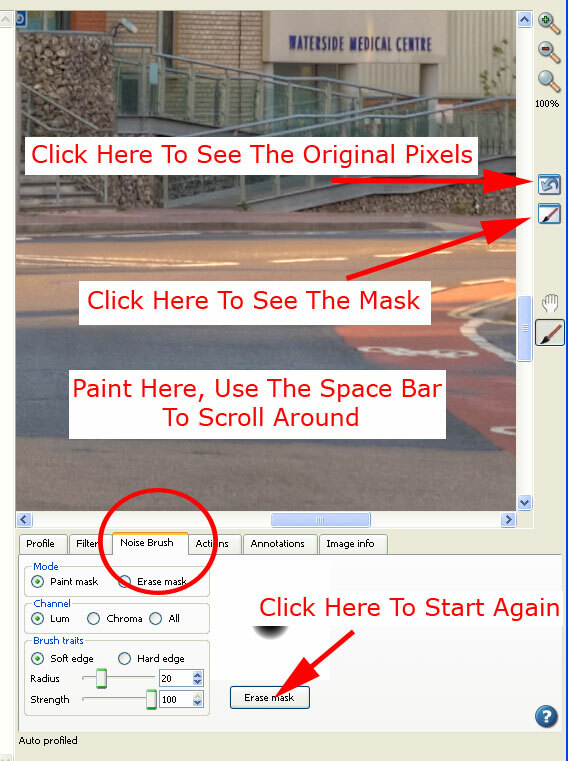 To start off, load an image into Photoshop or Elements, then fire up Noise Ninja, "Filter", "Picturecode", "Noise Ninja". Before we start masking, it may help to increase the size of the preview frame - in NN, "Noise Ninja", "Preferences" then click the "Other" tab, and choose a bigger preview Window size. What we're going to be doing is painting a mask in the preview pane, in effect stopping NN from changing the pixels behind the mask. You can change the size and hardness of your brush, look at the original pixels, see the mask, erase parts of your mask, or "Erase Mask" and start again. In my image, I don't want NN to work on the road, which is naturally "Noisy", so I choose a large brush and simply paint over the road in the photograph. Easy. Once you're done, just click OK, the Noise Filter will be applied (as will your mask) and you'll be sent back to Photoshop to finish your editing. Have a play, experiment, and learn to get more out of Noise Ninja! PS You could of course get a similar effect by duplicating your image on a different layer, applying NN to one of the layers, adding a layer mask, and then by "painting in / out" the NN filter.